The paper outlines the main problems of the Bulgarian higher education and science in the context of Bulgarian integration into the EU. What is emphasized is that there is no immediate correlation between the Bulgarian higher education reform and the process of negotiations with EU, since the educational policy of the EU, including the Bologna process, is not coercive as to the implementation of certain conditions but is rather based on the subsidiarity principle. Within these terms, the initiative and the responsibility for the reform parameters are referred to the state and its higher education institutions. The now functioning normative base is unable to solve the most serious and deepening problems of the higher education as: 1. Aging of the academic staff; 2. Ineffective higher school network; 3. Setting public and private universities on unequal terms; 4. Ineffective accreditation procedures; 5. Ineffective management; 6. Insufficient finance and ineffective admission procedures; 7. Education quality decrease, etc. 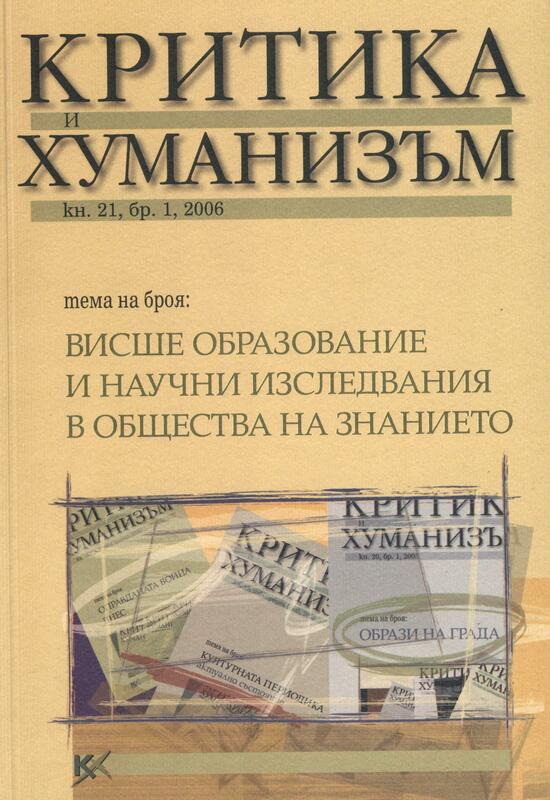 After a comparative analysis of three expert draft projects for Higher Education Law (proposed by expert groups presided by prof. Pepka Boyadjieva, prof. Kamen Velev, and prof. Anastas Gerdjikov) consensual solutions are searched for to ground an overall reform of the Bulgarian higher education normative base. Tatyana Kalkanova is Member of Parliament from the National Movement Simeon II parliamentary group, Vice President of the Education and Science Commission, member of the Energetics Commission. The aim of the current analysis is to compare 3 different projects for a new Higher education law and to outline both the consistent and the contradictory ideas of the authors. Each project has been analyzed on its own for the purpose of correctness and in-depth study of the correlations between suggested measures and major principles. Several conclusions may be drawn on the basis of that comparison. First and most important – there is consensus over the challenges, facing higher education, but no consensus over the pathway, which should be followed. There is consensus over the goals, but no consensus over the means. Hence, it could be predicted that Bulgarian academic community and the society as a whole have a long way to go before they can greet themselves on a common philosophy of higher education reform. Some of the ideas, proposed by the authors, are so contradictory, as if they do not address the same educational system. Such an example is the idea of neglecting the National evaluation and accreditation agency in respect to opening new higher education institutions, or the aspirations for total autonomy of the governing academic bodies. The analysis outlines several priorities that all projects agree on. Such is bigger economic autonomy, more accountability, better management and new procedures for rector elections. All three projects agree on the need of greater autonomy of university structures, more flexibility in fees, major reform of colleges. Tanya Petrova is journalist in Sega daily, “Education and Science” section. The paper examines three conceptions of new Bulgarian law of higher education and compares their approaches to existing problems. It finds out that regardless the differences between the proposed conceptions all three solve these problems in a similar way. They deal with questions of quality and financing, with the degree structure of the higher education system, student numbers and students enrolling, management and governance and recommend an academic autonomy accompanied by transparency and accountability as well as funding mechanisms based on competition. The proposed solutions are a good basis for preparing a modern higher education law. Anastas Gerdjikov is Associate Professor in Latin language and Roman Literature at Sofia University St. Kliment Ohridski, former Vice Minister of Higher Education of Bulgaria. His principal study interests are in the field of ancient and mediaeval literature, philosophy and political thinking. Author of the monographs Clementia: The Image of the Princeps in Roman Literature and the Ideology of the Early Principatum and The Image of the Prince in the Corpus of Latin Panegyrics, as well as of the first Bulgarian translation of Aristotle’s Politics. The higher education in Bulgaria still drops behind the times and develops in an environment that discourages the advance of the necessary remedial processes. Despite the claims that education and science are a priority of every government, the burdensome problems faced by the system are often being solved not as a matter of principle but under the pressure of merely opportunistic and corporate interests. In consequence of a misunderstood university autonomy, the state turned out to be helpless to exert its controlling functions over the system, and in order to restrict the apparent disadvantages it imprisoned the system in a series of formal normative requirements unknown in other states. The Higher Education Law has already exhausted its capacity and now seriously barriers the integration of the Bulgarian higher education in the unified European educational space. A special attention is to be paid to the discussion of the fundamental questions about the management of the higher schools and about the financing of higher education and scientific research. The managerial scheme imposed by the Act on Higher Education is out of date, it is marked social relations that are not present any longer, and does not match the elementary principles of effectiveness and accountability. Not mentioning the unnecessarily big number of higher education institutions in Bulgaria, nor the voluntaristic way to define the scope of their activities, what comes to the fore are the problems of the total state funding of higher education and science and of its effective distribution. Groundless as they are, the currently valid coefficients for budget allotment and the applied mechanism at least produced certain stability, predictability, and transparency in the system. That mechanism however, is connected with another archaism – the state enrollment quotas for students. Therefore, together with the need for increasing the funds for higher education and science, a new mechanism of financing is to be set up. Marko Todorov is Associate Professor in the University of Russe. He has graduated in Germany. His scientific interests are in the field of continuos mechanics and numerical methods. In 1993 and 2003, he was elected Rector of Russe University. He is also former Minister of Higher Education and Science of Bulgaria. Authors: Pepka Boyadjieva et al. Pepka Boyadjieva is Professor at the Bulgarian Academy of Sciences. Authors: Kamen Velev et al. Authors: Anastas Gerdjikov et al. Anastas Gerdjikov is Associate Professor in Latin Language and Roman Literature at Sofia University St. Kliment Okridski, former Vice Minister of Higher Education of Bulgaria. His principal study interests are in the field of ancient and mediaeval literature, philosophy and political thinking. Author of the monographs Clementia. The Image of the Princeps in Roman Literature and the Ideology of the Early Principatum and The Image of the Prince in the Corpus of Latin Panegyrics, as well as of the first Bulgarian translation of Aristotle’s Politics. The article discusses the system of conferring of academic degrees and academic ranks in Bulgaria related to the opportunities for professional development of lecturers and research workers. It begins with ascertaining that the legislation in this field is very old and needs to be renewed. It follows the assertion that the most important crisis phenomena in Bulgarian academic field are closely connected with the lack of reform in the system of conferring academic degrees and academic ranks. The next item is an author’s proposal of a set of requirements that has to meet an effective system of conferring of academic degrees and academic ranks. These requirements are competency, impartiality, fairness, transparency, simplicity and intelligibility. The present system is unable to meet these requirements. There are three different draft bills on conferring of academic degrees and academic ranks proposed by Bulgarian parliamentarians two years ago. The critical analysis of those proposals reveals both their advantages and weak sides. Finally the author formulates his own proposal for integral reform of this system. This reform has to guaranty decisive simplification of all procedures, competent and impartial evaluative bodies and also transparency and accountability of their work. Hristo Tododrov is Professor of Philosophy at New Bulgarian University, head of the Department of Philosophy and Sociology. The paper aims to outline the significant problems and perspectives facing higher education through an analysis of the tendencies in the Bulgarian and European area in the last few years. It takes into account the challenges presented after the meetings in Glasgow and Bergen in 2005. Perspectives of development are sought by relying on proven practices i Europe and in our country. The paper defines the tasks that will be on the agenda of Bulgarian higher education institutions this and next year and that synchronize Bulgarian and European tendencies in the sphere of developing the competences, the credit system, the quality assurance systems, the fulfilling of a university’s mission and the governing structures. The model NBU is put forward as a model of a successfully working innovative university. Special attention is paid to formulating the competences. It is recommended that this should be done in accordance with the model of the project “Tuning educational structures in Europe” after consultations with employers, academia and alumni. Formulating the competences is necessary to determine the most suitable design of degree programs interms of their structure and contents on one hand and their orientation towards the labour market or further scientific research, on the other. Miroslav Dachev is Professor of Semiotics and Literary Critisicm at the New Bulgarian University, Sofia. His principal research interests include semiotics of literature, theory of poetic language and history of European modernism from the point of view of intertextuality. He is author of the monographs: Semiotics of Colour in Poetic Text; Beyond the Shadows of the Signs: Essays on Semiotics and Poetics, and Word and Image. At present he is Vice Rector of Academic Affairs at the New Bulgarian University. This paper originated as a presentation in the discussion “Bologna initiative in Eastern Europe: Political opportunism or the last chance for a reform”, chaired by Voldemar Tomusk. This was the final step in the track “Prague Summit 2001” of the 24th Annual EAIR forum, held in Prague in September 2002. My main ambition in this text is not only to advocate in favour of the Bologna declaration and to appeal for quicker impact and implementation of its values in the European countries. My greatest intention in this essay is to remind the over-skeptical colleagues that despite the sociological reductionism, the ideas and the ideals do exist. True, some of them sometimes turn out to be na?ve neo-romantic utopias. But nevertheless, it is a ridiculous over-simplification to emphasize that the Bologna ideals are only stupid contrivances of some clerks in Brussels and some politicians all over the continent. On the contrary: They have their own immanent origin and an enormous inspiring force over many humble university persons, especially in Eastern Europe. Dimka Gicheva-Gocheva is Associate Professor at Sofia University St. Kliment Ohridski. She teaches History of Philosophy. Author of In the Labyrinth of Plato and Aristotle and New Meditations on Aristotelian Teleologism, as well as of two anthologies in the “practical philosophy” of the Bulgarian higher education: The University: Which Way Now and About Europe and University. The Turkish higher education system today comprises 53 state and 24 private universities, with over 2 million students, about 80,000 academic staff and a gross enrolment ratio of about 37%, up from 6% 25 years ago. This paper is concerned with the origins and the evolution of the system, with particular emphasis on differentiation and diversification of institutions and the various governance models practiced in different periods. Statistics are presented that show the growth in student and staff numbers, the number of publications by staff and the variation in expenditures in different years. Kemal Guruz is former Rector of Karadeniz Technical University in Trabzon, Turkey (1985-1990). In 1995-2003 he served as President of the Council of Higher Education of the Republic of Turkey. He was awarded an honorary doctoral degree (Doctor of Humane Letters, honoris causa) by the State University of New York at Binghamton for his contributions to higher education in the international arena. He has numerious publications in administrative and policy aspects of science, technology and higher education systems. The paper traces the main indicators of higher education and scientific research system in Croatia, as well as its changes realized during the last 5 years with regard to its accordance with Bologna process. Figures and data are presented as to the normative base, the higher education structure, students and academic staff, financing system, introduction of two-stage education system, and quality assessment and accreditation. Within the context of comparative analysis with other states, the particular normative and political measures are presented that were recently taken to reform the system and the immediate challenges faced by Croatia today are outlined. Pavo Barisic is Professor of Philosophy, Zagreb University. Vice Minister of Education, Science and Sports of Republic of Croatia. Chief editor of Filozofska Istrazivanja journal. The paper reviews the challenges that the Bulgarian Education and Research faces at the edge of the knowledge-based society. It is argued that Bulgarian universities have to reform themselves in a rather revolutionary way and extremely rapidly if they want to survive on the global educational market. The main problems are analyzed and suggestions for possible actions are proposed. The experience that the New Bulgarian University has accumulated on the market for the last 15 years has been used and analyzed. Boicho Kokinov is Associate Professor in Cognitive Science, New Bulgarian University. He studies human thinking and memory, designs computer models, and conducts psychological experiments. Director of Central and Eastern European Center in Cognitive Science, New Bulgarian University, Vice Rector for quality initiative. Doctoral programmes and the European identity: What is to be done? Dimiter Dimov is PhD. student at the Department of History and Theory of Culture, Sofia University St. Kliment Ohridski. His academic interests are in the field of cultural semiotics, philosophy of language and sign systems, iconicity. He coordinates www.phdgate.net project, an integrated database of Bulgarian PhD Students initiated by the Centre for Advanced Study, the Association of Bulgarian PhDs and Centre for Education at the Bulgarian Academy of Sciences. Rastko Močnik is Professor in Sociology of Culture, Ljubliana University, author of over 250 publications in 13 languages devoted to sociology of culture, sociology of literature, philosophy of language, theory of discourse, semiotics, theoretical anthropology, theoretical psychoanalysis, and political theory. Founder and member of the Senate of Institutum Studiorum Humanitatis – Ljubliana, Co-chair of the International Board of Directors of the Institute for Critical Social Studies at Plovdiv University, d.h.c. of Plovdiv University. Antony Todorov is Associate Professor in Political Science, Vice Rector of international relations at the New Bulgarian University. On the socio-genesis of knowledge: Why is the unification of higher education impossible? Krassimir Stojanov is Associate Professor in Philosophy at Hanover University. His major fields of research interest are social philosophy, critical theory, recognition paradigm, and philosophy of education. Vanya Serafimova is Assistant Professor in Sociology at the University of Mining and Geology, Sofia. Fields of study and research: sociology of information society, sociology of personality, urban sociology. Atanas Stamatov is Professor in History of Philosophy at the University of Mining and Geology, Sofia. His studies are in the fields of history of philosophy and philosophy of history. Dobrin Todorov is Associate Professor in Logics and History of Philosophy at the University of Mining and Geology, Sofia. His studies are in the fields of history of philosophy and philosophy of 20th century. Dessislava Lilova is Associate Professor at the Department of Cultural Studies, South-Western University, Blagoevgrad; Doctor of Philology. Her principal research interest refer to the relations of history and memory, modernity, nation, and identity. Author of Resurgent Meanings of National Name. Albena Hranova is Professor in Bulgarian Literature at Plovdiv University. She is author of the monographs The Two Bulgarian Literatures; The Literary Man and His Bulgarian Languages; Approaches to the Fairy Tale; Yavorov – Dialectcs and Alchemies; Language and Its Speeches; Bulgarian Intertexts and many papers in Bulgarian, English, Chezh, Croatian, and Russian. Виолета Герджикова е магистър по класическа филология (1987) и доктор по антична култура и литература (1998). Преподавателската й работа обхваща курсове по увод в класическата филология, старогръцка култура, римска култура, латински език за неспециалисти, академично писане. Изследователските й интереси са в областта на историята на античната култура и литература, класическото образование и рецепцията на античността. С тези области са свързани и участията й в редица научно-изследователски проекти. Специализирала е в Международния изследователски център за културология, Виена (2007). Йоана Сиракова е магистър по класическа филология и доцент по латински език и преводознание на Софийския университет „Св. Климент Охридски”, доктор по теория и практика на превода (класически езици). Преподавателската ѝ дейност включва курсове по история и теории на превода, латински език и римски автори (ораторска и философска проза, историография, поезия), проблеми на рецепцията на античните текстове в България, практически семинар по превод, историята на превода в историята на обществата. Изследователските ѝ интереси са в областта на преводознанието, на рецепцията на Античността в модерния свят, на усъвършенстването на образователните практики в преподаването на античните езици и цивилизация, с които са свързани и участията ѝ в редица научно-изследователски проекти. Специализирала е в областта на теорията на превода в Катедрата по класическа филология към Факултета по класически и нови филологии на Софийския университет, гост на Женевския университет към Секцията по латински език, гост-лектор на лятната школа „Docendo Discimus. Развитие и приложение на магистърска програма по латинска дидактика”, Институт по философия на Скопския университет. Участник е в международни изследователски групи, работещи в областта на рецепцията на Античността (Classical Receptions in Central and Eastern European Poetry, Oxford University Press, A Handbook to Classical Reception in Eastern and Central Europe, Wiley Blackwell Handbook to Classical Reception series). Николай Шаранков е бакалавър (2001) и докторант по класическа филология (2002-2004). От 2005 г. е асистент по история и историческа граматика на класическите езици. От 2002 г. е член на редакционната колегия на списание Archaeologia Bulgarica, а от 2003 г. – сътрудник на списание L’Année épigraphique. Специализира в Женева. Преподава историческа граматика на старогръцкия език, старогръцки език и автори – атическа ораторска проза и лирика, старогръцки език за начинаещи в специалност „Стара история”. Основните му научни интереси са в областта на историята и историческата граматика на гръцкия и латинския език, палеобалкански езици, антична култура, културна история на българските земи в древността. Анастас Герджиков е професор по римска литература, доктор на филологическите науки (антична и средновековна литература). Завършил е Хумболтовия университет, Берлин, специализирал е в Австрия (1994) и Германия (1997). Заемал е длъжностите заместник министър на образованието и науката (2001-2003), управител на Фонд „Научни изследвания” (2008-2009), заместник ректор на СУ „Св. Климент Охридски” (2010-2011). Член е на редколегията на списание „Стратегии на образователната и научната политика”. Преподавателската му работа обхваща курсове по латински език и автори (ораторска проза, историография, философия) и по римска литература. Научните му интереси са в областта на античната и средновековна литература, философия и политическа мисъл. Автор е на статии в български и чужди списания и сборници, на четири монографии, както и на първия български превод на Аристотеловата „Политика”. Конференцията "Висше образование и научни изследвания"
Димитър Вацов е доктор по философия и доцент в Департамента по философия и социология на Нов български университет. Той е главен редактор на сп. Критика и хуманизъм, както и председател на УС на Фондация за хуманитарни и социални науки – София. Автор е на следните книги: Опити върху властта и истината (2009), Свобода или признаване: Интерактивните извори на идентичността (2006); Онтология на утвърждаването: Ницше като задача (2003). Интересите му са в областта на политическата философия и особено критическата теория, както и постаналитичната философия на езика.